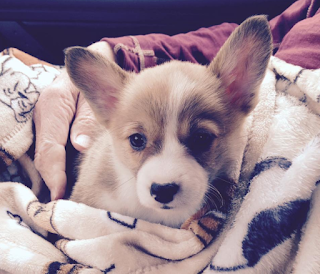 Olive, Corgi, 8 weeks old, came home to live with my friend Val this weekend. I've been trying for several weeks to decide whether I was going to participate in April Poetry Month. I finally decided I am going to give it a try. My theme, I think, for this month, is "Dog Days." I'm going to try to write thirty-ish days of dog-related poems. Today's poem is a tanka (5 lines, 5 7 5 7 7). "On Walking Through the Front Door"
Olive is precious! I've never had a dog, but I love reading about them and the people who love them. It will be fun to read your dog poems this month. I stopped by yesterday, wondering if you would be posting poetry, but I must have been a bit early. I'm so glad you're going to continue your writing streak into poetry month. This makes me very happy! I had the thought of writing 31 cat poems. Not sure yet if I'm really going to do that. Poetry is hard for me already and adding a limitation like that makes me very nervous. This is a strong opening poem, Carol, that captures so simply and beautifully the dog's constant joy. I WANT A CORGI!!! Olive is so darn CUTE! A month of dog poems...heaven! That all-accepting tail wag...heaven!